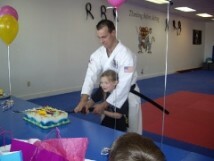 Birthdays are always a special event, But a Karate Birthday Party makes it UNFORGETTABLE! Your child will be a Black Belt for a day! Cake is cut with a real Samurai sword! Every child breaks a board (optional), a unique take-home gift! Medals and other martial arts items are available for favors! FREE birthday gift for the guest of honor! FREE Trial Membership given to each party guest! Learning, exercise, games and fun! Not a student? No problem!